There’s a lot in a name, Trunch has one that doesn’t fit in in Norfolk, or in fact in England. Locally it sits uneasily with the profusion of ~hams and ~tons, and ~bys and ~thorps. East Anglia’s toponymy is that of the invaded, repeatedly settled. People who move into a new house tend to move a lot of the furniture and redecorate and we live in a landscape which shows very little of our deeper history in place names. Norfolk has relatively few surviving Celtic place names, Trunch may be one of them. If it isn’t it could be the result of several human processes: It may have been brought in with the Normans, dragging the name of Le Trunchet Abbey which owned lands in Norfolk. Bringing it back here and in doing so unwittingly placed an old Gaelic hybrid word back into a landscape where the language was known but long since absorbed, forgotten and ultimately pushed west. The inhabitants in this scenario would have been people who wouldn’t have understood it in it’s original form either. Look at our modern language, see how much the modern language has changed in 500 years with our losses, scrapings and borrowings, how our dialects have shifted, it would have seemed strange even to the Anglians, Saxons and Danes who farmed here together at the end of the first millennium with their Common Germanic language roots. There are very few place names in use in East Anglia that are rooted further back than Norman, Danish, and Anglo-Saxon rule. 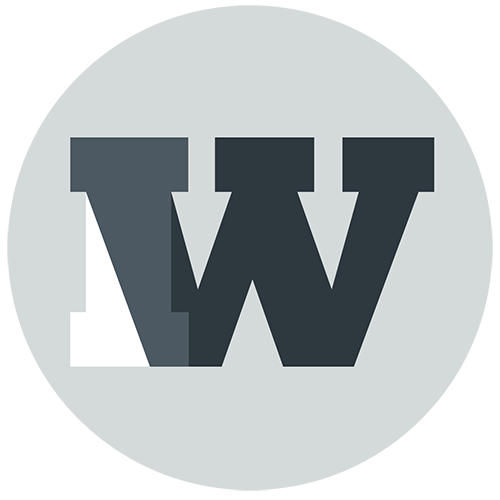 Place names which hint strongly at a Romano-British or earlier into Goidelic or Brythonic; broadly Gaelic and Welsh/British respectively. Both of these are rooted in the generative proto-Celtic language which arrived here from the continent during the Bronze or early Iron Age. We can’t even guess at most of it as records simply don’t exist and most of what we do know is down to comparative linguistic studies, It is a direct branch from the tree that the Proto-Indo-European language sits at the root of, and further back to the place where we all historically and socially are one. The village is listed at Trunchet in the Domesday Book, it still sounds foreign in our topographical lexicon. It is most likely a hybrid of the Goidelic of Trum~ and the Brythonic ~cēd, it is an ‘upland wood’. As you head towards it, up the slope of Swafield Rise onto the lumps and bumps of the periglacial boulder-fields towards the old glacial terminal moraine, you get some sense of the strange use of the word Upland in a Norfolk context. Norfolk isn’t flat, especially this area to the north-east. It’s our own clay/till downlands, the features planed down marginally by human use and cultivation, but it rolls with the punches the rest of Britain throws at it. Flat Norfolk is west in the filled in peat basins, the fen edges and the brecks way below the shadow of glacier’s toe. It is a big village, sprawls drowsily outwards from a medieval core into strips of bungalows. Whatever is underneath the nucleus is hidden for now; if it is as old as the name might suggest, if we assume the name is local, this may be one of the few in the area with a foot still in pre-roman times, something hinted at nearby in the Wealh’s cot of Walcot. The Creig or cliff of North and South Creake and in the Udsos of the river name Ouse. Beyond the quiet lawns and painted fences to the North of the village, in the fields there are the shadows of barrows and burial mounds, the whisper of a Roman or Iron age settlement, detail so far undisclosed even by the steady tick-tock sway of the detectorists. Field-walking has offered up a few clues, mostly pottery. There’s been flint, but flint in it’s many forms is like sugar sprinkled on a cake in Norfolk, in an area which had an economy built on it, mined the stuff, built with it. The fields are full of plough shatter, so much so it’s almost difficult to spot anything worked until you get your eye in, spotting the bulbs and fractures of a human struck surface, the nicks of an antler-hammers and picks on a toothed edge. This is another one of those old haunts. friends lived and worked; One drove aggregate lorries to-and-fro from depot to quarry and back again, setting out where the old adumbrations of the ice waters, the glacial rivers and lakes dry-flow under the till to where they made the concrete which now makes us flood. We used to cycle up Swafield Rise and meet up in one of the bungalows now lost in a row somewhere, a memory gone. We messed about listening to music, re-reading old copies of Sounds and NME. I silently fancied my mate’s older, sophisticated, sister something rotten. On the odd occasion when we were allowed access, we stared dumbfounded at his dad’s collection of model kits in the loft. A middle-aged, bearded Irish man, obsessed by the Fleet Air Arm, his lifetime hobby was a huge squadron in the same dark blues and greys, meticulously created in 1/72 scale styrene, obsessively recording each type of aeroplane flown laid out in ranks on a huge chipboard table. A wardrobe overflowed with the ingredients for more recipes; detailing sets, unmade kits, cement, tools and paints. Maybe we outwardly sniffed a tiny bit, teenagers know what’s coolest after all, but I admired it and him. Unwittingly we’d already started out on the path of our own obsessions; our model kits discarded we’d started on the path of Epiphone copies of Gibson guitars we couldn’t afford, Fender shapes in cheap wood from Japan. Nothing much changes in the rolling process of the generations, people collect, quantify, obsess, measure, paint, write, draw, religiously fill the time between the start and the end searching the patterns recording them. When you get in amongst it, the village builds up, the church feels raised houses inexplicably taller, it is built on a slight rise. I once read somewhere that nearly all of the older parts of Trunch were farm buildings with a scattering of small potteries. 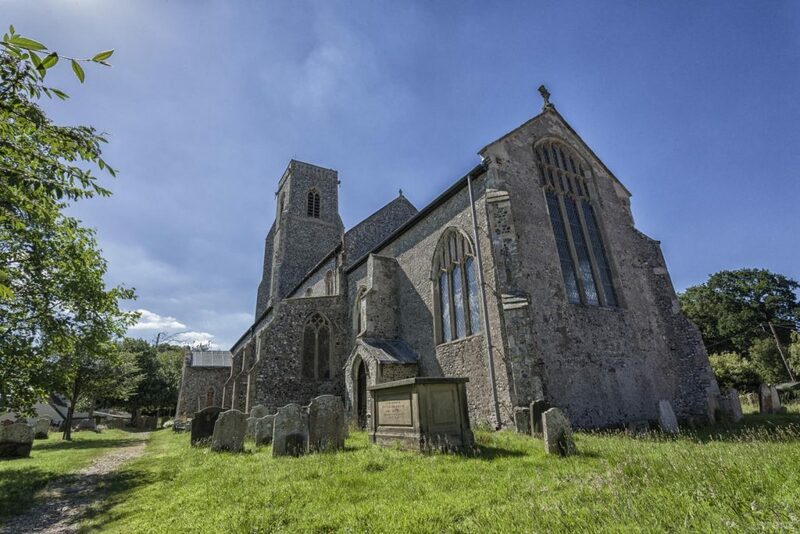 The church is dedicated to St Botolph; an English 7th century saint of travellers and farmers, a dedication often found at gateways here at the gateway to the coast. The outside of the church is pretty enough a quick perimeter walk is enough for me as it’s getting late. Inside I know you can lose hours just finding things, all the result of 700 years of townsfolk and church people mucking about. It is phenomenal building, layer upon layer of the shifting energy of change. In terms of available material it’s so well covered by the four photocopied guide books on the table, and on the church website, there’s little point in me just regurgitating it here. There’s a lot of ornately carved, spiritually charged wood inside. I’d guess sometimes time is short for the blunt minded, so a remarkable amount has survived. The medieval font cover alone is worth the visit, one of only four in Britain; a second sits in St Peter Mancroft in Norwich. How it has survived is a singular curiosity. In 1560 the Anglican’s came in the King’s name, erasing some of the idolatry, picked away at gilding and paint on saints and angels. Then in 1640 William Dowsing’s men barged in again with their sharp blades and clockwork hearts with yet more iconoclasm. But they didn’t smash the font cover to matchwood which they could have easily done. Betjeman loved it, ‘It exalts the very first sacrament: baptism by water – the first armour we put on against the assaults of hate, greed and fear on our journey back to eternity’. It is strange and good. Some of the carvings were prised off and they certainly had a good scratch at some more of the symbolism. 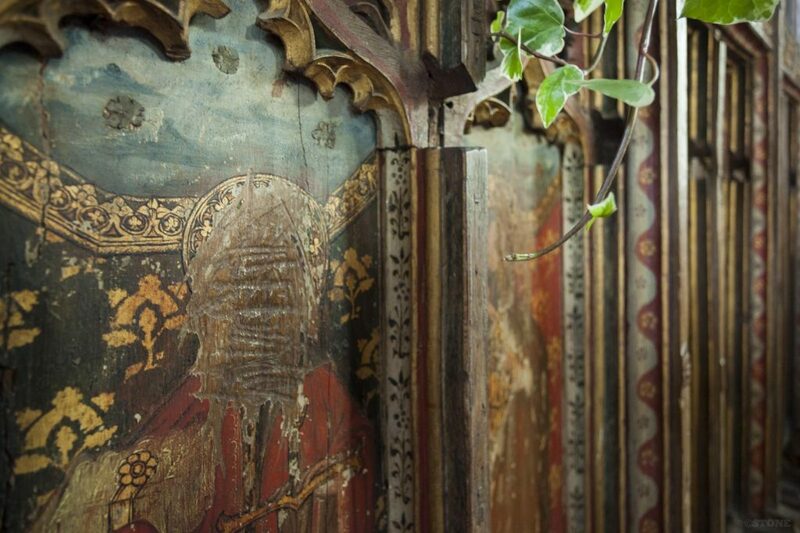 The rood screen in particular is partially faceless as a result, but what it retains is beautifully ornate, richly coloured and captivating. The carvings and remaining colour across the church are pretty special. The blues of heaven stand out, an expensive poisonous colour to make back then. 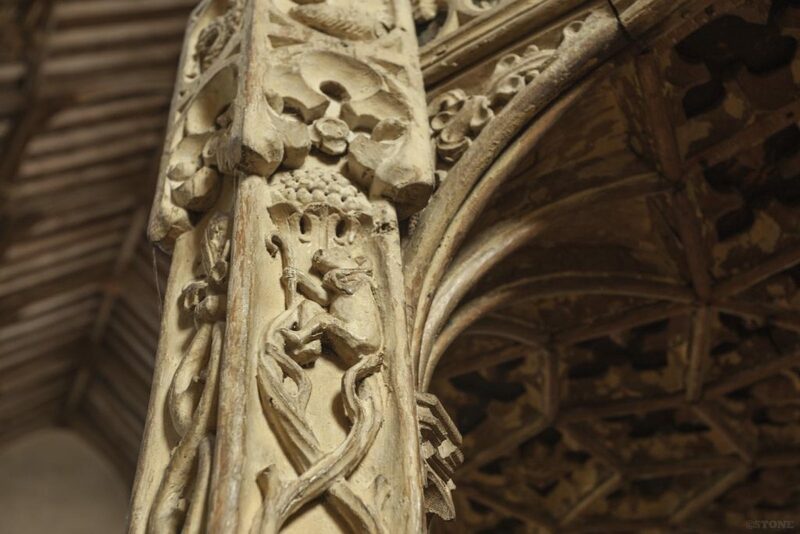 There is still a carving of an ape carrying a crosier and either a pectoral cross or a cowl on the font cover, a dig at someone or something possibly. 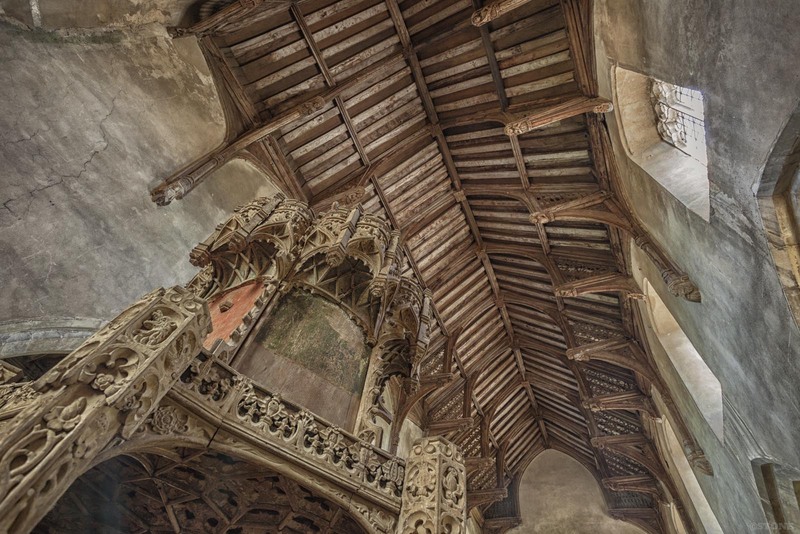 In terms of woodwork the green men and dog’s heads stand out, a vague echo of older folk memory, other beliefs, absorbed as charms within the not quite encompassing Christian symbols. The hounds are fierce, as I stand here it reminds me again of how I’m in the beating heartland of the black dog; Trunch sleeping deep in the network of lanes where these stories still lurk red-eyed in the depths of our febrile nights. There’s graffiti; the place has a good covering; some is medieval; there’s several Three Men’s Morris boards, a game which is in itself at least 3,500 years old. The majority of the scratchings are 17th and 18th century, and mostly rest in the surface of the oak of the choir stalls. 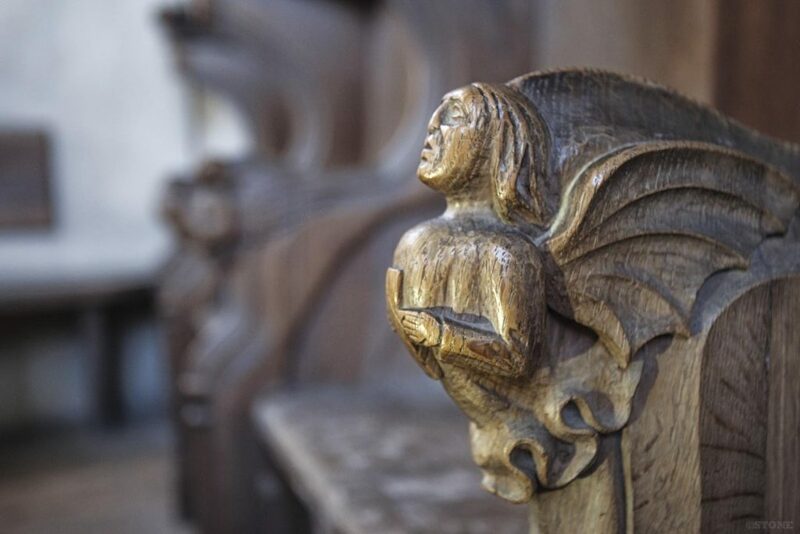 The choirs are quite something in themselves; Medieval misericords featuring a mixture of angels and demons and some figures in-between. 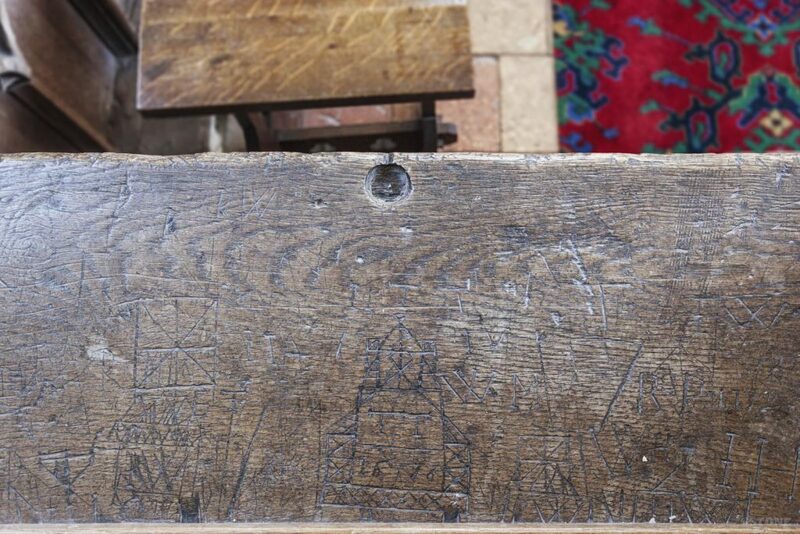 The scribblings themselves seems to date back to the chancel being used as a school room. It’s always slightly odd to run your fingers over something someone carved into an object hundreds of years ago, somebody deliberately identifying themselves to you, making themselves although largely anonymous, remembered. An unknown instance routed through your fingertips. Some are dated (the picture below has one that dates to 1676) which is somehow oddly comforting as we all appear and vanish as the road-roller of the years brutally pushes on. There’s some rather nice medieval glass fragments hidden on the north side of the celestory, mostly broken angels. 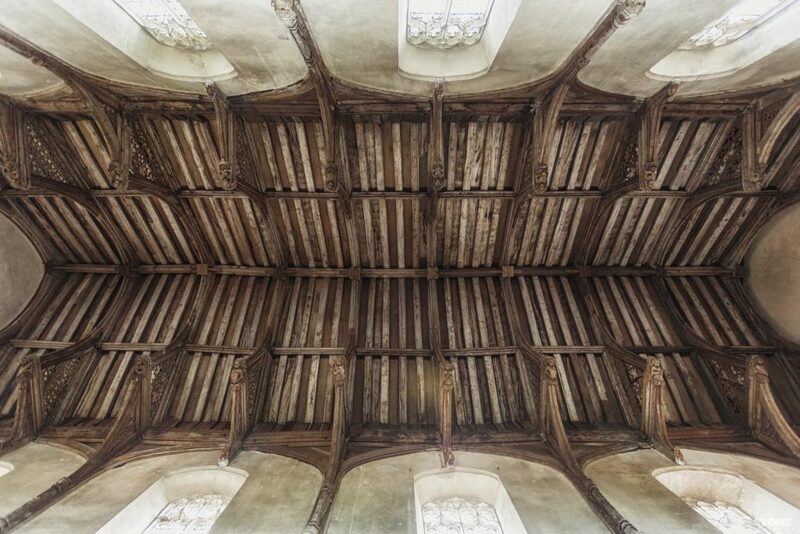 There’s also a 15th century hammer beam angel roof far away above, all worth buying binoculars for. 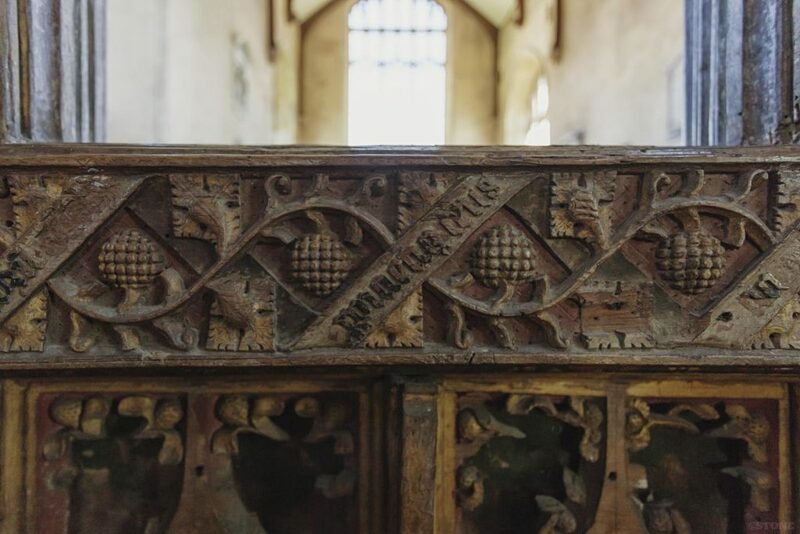 Among other things to look out for are the pretty scalloped piscina, the reredos boards which are a sympathetic and interesting Victorian job, and a ledger stone for the local Ward family includes Horatia Nelson; Nelson’s daughter; who married into the family. There’s also a hagioscope or ‘squint’ which goes nowhere, at some point this would have opened into a side chapel, so the various doings with the host could be viewed from there, now the site of the oil tank for the heating. The architecture is a bit of a mixture of decorated and perpendicular. The latter being simpler than the former, this change might in this case be the result of a sudden lack of masons at a critical moment due to the Black Death. Outside among the grave stones the sun is starting to lower into the late afternoon. There’s names I recognise in here, from research, writing, the past, the pub; Dix, Abigail, Primrose, Fuller to name a few. I’m watched as I leave, a woman with a push-pull mower fighting the creep of the grass on the verge outside one of the bungalows, she tries to not be seen as she watches, but I’m aware of the glances as I head back to the car hidden in a narrow backstreet at the back of the pub. 35 years and I’m a stranger to this dust. Go. Go and see, run your finger along the lines, draw your own. My father strolled behind me, calm and slow. Our moorings and the masthead would appear. Telling of all the moonlit reeds around. John Betjeman – Passion for churches 1974.